Our goal here is to help you plan & build the tile shower and bathroom of your dreams; one that gives you that spa-like experience every time you use it. A modern spa-like bathroom should provide an oasis from the stresses of daily life, helping you unwind and destress. There are countless products on the market today that will help you achieve the goal of creating a luxurious bathroom and custom tile shower. But perhaps none provide that finishing touch more so than a wall-mounted electric towel warmer. 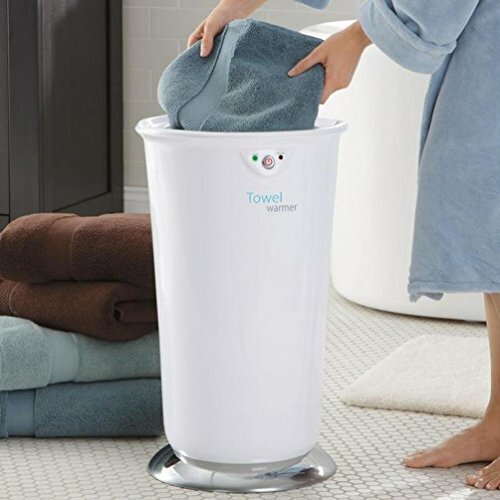 Like the feeling of clothes fresh out of the dryer, a hot towel warmer will have your bath towels warm and toasty, waiting for you when your shower is done. No longer are towel warmers only for luxurious hotels and spas; today there are many models that are affordable for the average bathroom renovation. Let’s dive in to this Buyer’s Guide, to help you find the one that fits your situation the best! What Is A Towel Warmer? For Starters, What Is A Towel Warmer? Common in Europe for quite a long time, where it’s often damp & cool, but less known to those in the United States, they’re a bathroom fixture you can hang your bath towels on, and while you’re showering, it’s heating up your towel so it feels nice and toasty when you grab it after the shower. Not only do they warm towels for you while you’re in the shower, but they also help to dry out wet towels after being used, and you can even hang clothes on them to dry. If you live in a climate that is commonly cool & damp, hanging your towels and clothes on an electric wall-mounted towel warmer will dry them faster than just hanging naturally, reducing mildew and must issues. Although some reviews you’ll read online tell you a towel warmer rack can also be helpful in warming the bathroom, towel warming racks don’t really put out enough heat to make a noticeable difference in the room temperature. They’re essentially putting out the heat of a 100 watt light bulb, enough to heat the towels resting directly on the towel warmer rack. What quality of warmer can I afford with my budget: a luxury, premium, standard, or budget model? Understand the difference between electric & hydronic towel warming bars. What’s my style of choice: traditional, sleek & modern, somewhere in between? Finish/color that fits your style & decor: chrome, stainless, oil-rubbed bronze, etc. There’s no right or wrong amount of money to spend on a wall mounted towel warmer; we all have differing budgets and circumstances. With that said, in wall mount electric or hydronic towel warmers, as with many other home improvement products, as the old adage says “you get what you pay for.” So, if you can afford to spend up a bit, you will be pleased with the higher quality towel warmer you chose. If you’re on a tighter budget, expect to spend $100-200 on a decent towel warmer. If you can spend a bit more, in the $200-400 range, you’ll find you have many more choices of towel warmers with 4-star+ ratings and positive reviews. And, what we categorize as Premium or Luxury towel warmers, will be anywhere from $400 or so, all the way up to $1,000+. You’ll find that these higher end towel warmers may be larger, made of better materials, thicker metal, more solidly assembled, offer sleek & trendy designs, and/or heat up faster. Regarding electric wall-mounted towel warmers, there are two varieties: those that plug into their electric source and those that can be hard wired into an electrical source. If you have very little DIY ability, you’ll want a plug-in type, where you can simply mount the towel warmer on the wall and plug it into a nearby electrical receptacle. The downside to these is the exposed, hanging electric cord can make the unit look cheaper, less finished, or less of a permanent fixture in the bathroom. Hardwired towel warmers have the electric wires coming out of the back side of a lower corner of the unit, which can be mounted directly in front of a recessed electric box in the wall. If you 1) already have an electric box with power supply in the right place in the wall, 2) have the DIY know-how to do minor home electrical work, or 3) want to hire an electrician to run a wire and install a box in the right place before mounting your new towel warmer, then a hard-wired towel rack is really the best choice, as you’ll be most pleased with how the end result looks. You’ll find towel warmers come in two main categories: free standing, and wall mounted. 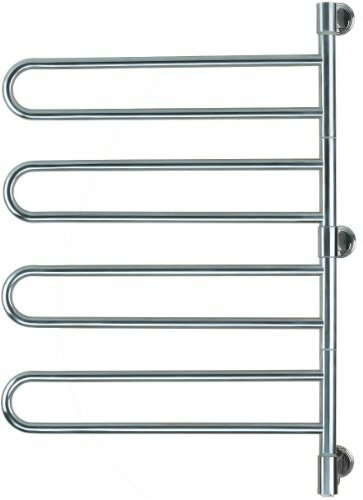 Wall mounted towel warmers take up less floor space, which can be quite valuable in many smaller bathrooms, and can usually take the place of where a standard towel bar would be mounted. They tend to be more sleek and stylish than freestanding models, and appear to be a more permanent fixture in the bathroom. They are also often larger than free standing versions, giving you more towel hanging capacity. Freestanding units usually have the benefit of being cheaper, and of course portable. If you rent a house or apartment where you can’t make permanent changes to the property, a free-standing towel warmer could be your best choice. 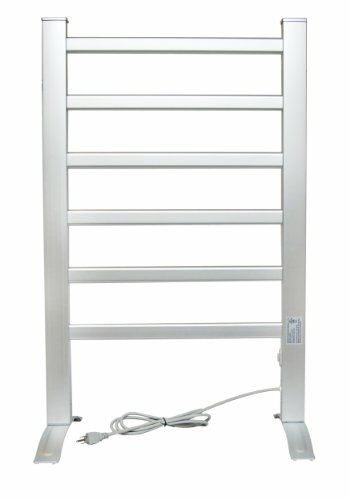 Electric towel warmer models are the most commonly used today, primarily because of their ease of installation. Most models operate much like an electric space heater, having a dry heating element that directly heats the bars from the inside. To a lesser extent, you’ll find some towel warmers that have a heating element that heats a mineral oil that fills the inside of the unit. In contrast to space heaters that draw high wattages of electricity, you’ll find most electric towel warmers only use around 60 to 150 watts of power. Hydronic towel warmers are heated by being connected to either 1) the hot water supply of your home’s plumbing (an open system, or 2) a system of hot water pipes that feed radiators, heaters, or other things (a closed system), not connected to the potable water that feeds your sinks, showers, and such. If you want to place the towel warmer in the entryway of a large walk-in shower, or if local codes prohibit you from placing an electric towel warmer near your tub or shower, then a hydronic towel warmer is the one to choose. These are the most efficient towel warmers, using the least energy, but they’re also the most difficult to install in an existing home. If you’re renovating your bathroom to build an all new tile shower, that’s your best time to run additional plumbing to where you want the hydronic wall mounted towel warmer to be placed. If you go with a hydronic towel warmer, pay very close attention to the details in the literature from the manufacturer of the one you’re thinking of purchasing, where it should state clearly if it’s intended for an open-loop or closed-loop system. The reason being, codes restrict what metals your potable water supply may come in contact with…and if you’re connecting your new hydronic wall mounted towel warmer to your hot water plumbing, water can pass through it and then to an outlet like a shower head or sink faucet. Towel warmers constructed of stainless steel can be connected to potable water plumbing (OPEN systems) in all states of the USA, whereas those made of steel MUST be used on a CLOSED system in all states. And somewhere in between, towel warmers made with brass can be acceptable on an open loop system in some states & localities, but not in others. Now, if you have a closed loop system that provides heated water to radiators, radiant floor heating, or something like that, you have less to worry about connecting your towel warmer to that, because it’s not coming in contact with your potable water. Additionally, if the water is ever shut off in your house, you may need to bleed the air out of your towel warmer, depending on the one you choose. Basically, check with your local codes as to what’s acceptable, and find the hydronic towel warmer that fits your situation (bathroom layout, plumbing available, materials used in the towel warmer you want, and your local codes). This one is quite simple – know the overall style you’re going for in your bathroom and get a towel warmer to match. The shape, style, and design of the towel warmer can give it a European, traditional, modern, or retro look. Some models also include a shelf on top for extra heating & storage. Additionally, you will find many choices in finish, including matte black, oil-rubbed bronze, white, stainless steel, chrome, and more. 7. Timer or No Timer? A towel warmer with timer can provide an added touch of automation and ease to your new luxury spa-like bathroom. Most towel warmers today are relatively economical and efficient, using little electricity, so they can be left on all the time…but if you’re cost conscious and want to save everywhere possible, having a towel warmer with timer is a great choice. With a timer built in, you can set the towel warmer to come on a set number of hours before you usually take a shower, so it will have the towels warm & toasty when that time comes! If you’re getting a hardwired wall mounted electric towel warmer, and running new wiring to it, you could route the electricity through either an on/off switch or through your own separate timer, if one isn’t built into the towel warmer you choose. Modern towel warmer models incorporate safety features by default; but some have more than others. Many have an auto shutoff feature if the unit gets over a set temperature. Also, some will let you adjust the temperature the towel warmer rack heats up to, so if you have children, you could set it to a lower temperature so they don’t get burned touching it. With all of the considerations and variables we just laid out above, it’s impossible to tell you THE BEST towel warmer for YOUR specific situation. You’ll have to determine which one fits all of your needs & desires, the look & style you want, and has all the features you want. But, there are a LOT of towel warmers available on the market. So, we can at least help narrow down that list for you. How did we choose our recommended list of towel warmers below? Many “towel warmer reviews” you’ll find searching online appear to simply be a random list of towel warmers the authors drew out of a hat. Here, we’ve actually taken a lot of time – so you don’t have to! – to sort through all the products available. We have weighted their customer ratings, reviews left by customers, the good & the bad, the pros & the cons, their prices, and more. Additionally, we’ve considered common features, time they take to heat up, etc. And with all that information, along with having a pulse on what trends & styles are most common in current bathrooms, we’ve come up with what we think would be the best choice for the “average person” in each budget level: what we have categorized as Luxury, Premium, Standard, and Budget. With a sleek design of round tubes and curved bars, this model will fit in perfectly with the style and decor of many modern homes. Amba has given much attention to safety on this one, with a built-in thermostat and internal thermal cutout. It uses 175 watts of power to maintain a 145-154 degrees Fahrenheit temperature, and you can choose to control this towel warmer’s operation with a simple on/off switch or a programmable timer. With 13 total bars (in a 4-4-5 configuration) and a total height of 36″, you can hang 3 towels unfolded at once, or up to 6 towels folded over. It’s hardwired to your electrical supply on a 115 volt circuit, so it will give the look of a permanent fixture of your luxurious bathroom, with no cords exposes and hanging down. Shown here is the oil-rubbed bronze model, but if you prefer another finish, in browsing around you can also find this Jeeves curved towel warmer in polished, brushed, white, and matte black finishes! 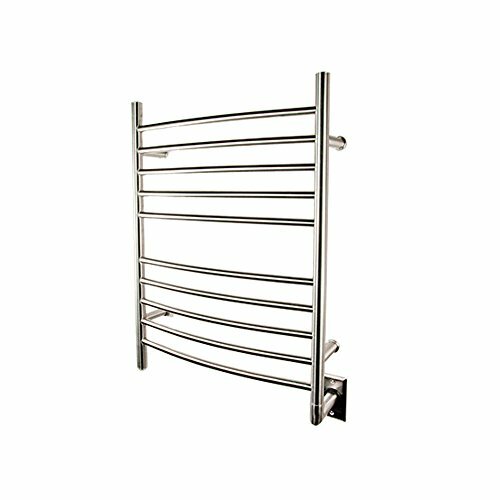 Another Amba product takes a top spot in our choice for the best premium towel warmer. 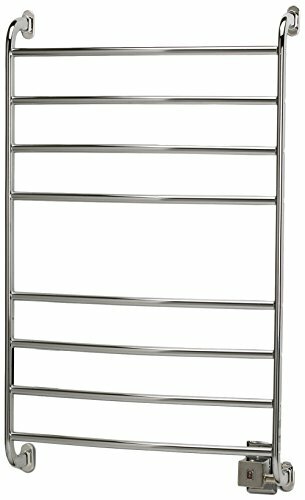 It’s style and design is much like the Jeeves model above, curved bars of tubular shape, but smaller with 10 bars, in a 5 & 5 configuration, allowing you to hang 2 towels instead at once. Hardwired to the electric supply (115 volt circuit), and no cords hanging down, you’ll get a clean look with this on your wall. It has an integrated on/off switch on the bottom of the vertical bar, but you could also wire into a programmable timer or separate switch if you like. This model uses 150 watts of electricity to get your towels warmed up quickly. Earning 3.9 out of 5 stars on Amazon, this towel warmer has pleased many homeowners! Note: Use caution around the towel warmer while turned on, but not covered with a towel. Some customer reviews have indicated the towel warmer gets very hot, enough to slightly burn one’s skin. That’s good it gets that hot to warm your towels quickly, but something to watch for otherwise. This towel warmer from Myson has garnered 3.4 out of 5 stars on Amazon, about the rating that would be expected for a product of average quality. Its size (3″ deep x 26″ wide x 32″ high) and the fact that it is the plug-in variety of towel warmers, with a cord hanging from the bottom, are also factors that fit this model into our Budget category. At just under $100, this unit is quite affordable for a wall mount electric towel warmer. And with 3.6 out of 5 stars on Amazon, it’s got some great reviews. But the overall design, with thinner tubes, more space between the bars, and the “clunkiness” of where it mounts to the wall and to the electrical supply are what bring this model into our Budget category. This towel warmer uses 105 watts of electricity to keep your towels warm & fresh, and it also comes with a 1 year warranty. It also has either a hard-wired or corded plug-in option of connecting to your electric supply. Just like with the electric wall mounted towel warmers above, for the hydronic towel warmers, we considered all things including reviews, ratings, prices, features, brand reputation, and more, to come up with our “Top 3 List”. In general, Amba & Runtal are two brands you can find quite easily to purchase online that tend to have positive reviews and a reputation for being high quality. NOTE: Many reviews from homeowners who bought Myson hydronic towel warmers indicate they began leaking after a couple years. For that reason, although they have some very stylish designs, we have NOT included any of their models in our recommended choices. Runtal is a high end brand that has received many positive reviews, and high ratings, from customers. At 33 inches tall by 20 inches wide, it will comfortably hold three towels. Constructed of steel, with a chrome finish, it comes with a limited 5 year warranty from the manufacturer. 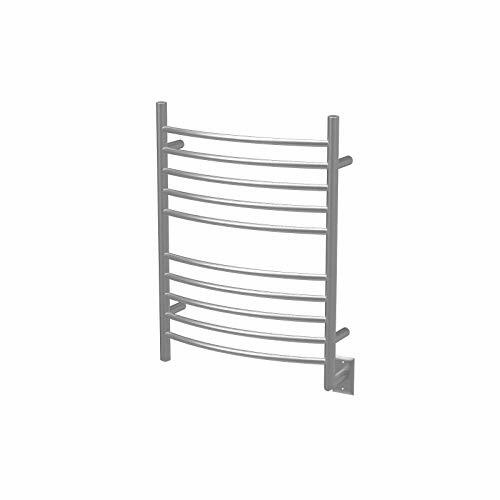 All of Amba’s towel warmers available online are electric, by default, but many of their top towel warmers are able to be made hydronic by Special Order through their website or by calling them. Check out Amba Products for that. One of our favorite lines of towel warmers they sell is the Jeeves model. 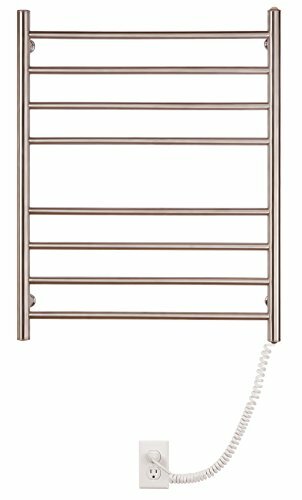 Jeeves towel warmers are stylish, modern, and sleek fitting the style of many new bathroom renovations; and they can have either curved or straight hanging bars. You’ll have numerous choices of finish, including chrome, polished or brushed stainless steel, oil-rubbed bronze, matte black, and white. 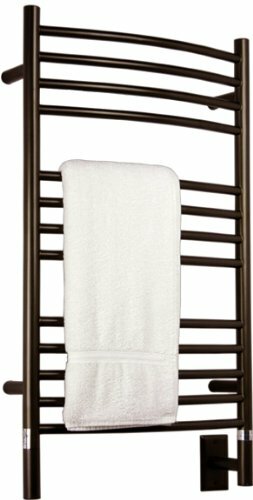 This Italian hydronic towel warmer comes in white, with straight bars, and is 20 inches wide by 48″ tall, which will easily hold three bath towels. I’m personally not a huge fan of the swiveling feature…I’d prefer a wall-mounted towel warmer that’s permanent and stationary, without moving parts – which adds one more possibility of something to break, wear out, or go wrong over time. BUT, I’m sure there are some circumstances where you may be limited on space or just want to be able to swivel out the towel warming arm when using it, and swing it back away when not using it. If that’s the case, this model from Amba would be a great one to choose, having a 3.9 out of 5 star rating on Amazon, and a 5 year warranty from the manufacturer. The swivel hinge allows each arm/bar to independently rotate 180 degrees. It has on/off switch under the bottom of the unit, with indicator light, and a hanging cord to plug the unit into electricity. It’s 25″ wide x 3.9″ deep x 37″ high, weighs 10 pounds, is constructed of stainless steel, and heats to an average of 136 degrees Fahrenheit. Although a wall-mounted towel warmer makes the highest quality statement as a luxurious permanent fixture of your bathroom, there are cases where a free standing towel warmer makes more sense; such as if you live in an apartment or house you rent, or if you plan to move soon/often. If a free standing towel warmer is the way you want to go, this one makes a nice, low cost option for you. Its 3.5 stars on Amazon is pretty good for coming in at less than $100 in price. While they take up valuable floor space, canister style warmers like this one can be safer, with the hot surfaces being inside the canister, and they can heat your towels faster since the towels are placed inside where the heat is enclosed. 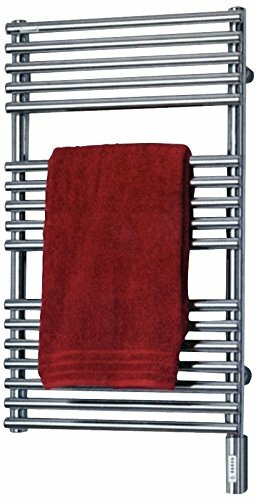 This Brookstone towel warmer, made in the USA, has great reviews and a 3.8 out of 5 star rating on Amazon. It holds 2 towels at a time, and warms them to 120 degrees Fahrenheit within 10 minutes. The transparent lid allows you to see inside without opening and letting heat out. I know many people are tempted to go with the cheapest option, thinking they’ve found a bargain. But, when it comes to electric towel warmers, this is truly one of those things where you get what you pay for. If you have the budget for the “luxury” and “premium” level of electric towel warmers, you’ll definitely be pleased with spending up, and getting something like one of the Amba towel warmers, which are highly rated by many satisfied customers. But, if you don’t have that kind of budget, it’s quite understandable…that’s where most people are. Just beware that satisfaction ratings and reviews drop significantly on electric towel warmers once you go under $200. Wall-mounted towel warmers $200 and above, see much higher ratings, and seem to leave buyers much happier with their purchases. And if your budget allows even more, those units that are $800-$1,000 and more, will provide that ultimate touch of luxury to your new bathroom. Ultimately, you need to choose what fits your budget, and offers the style and look you want! When determining the height at which you’re mounting the towel warmer to the wall, be sure to take into consideration the length your lower towel will hang down from the unit, so you don’t have it hanging down and touching the floor. Location consideration: check your local codes. Some may forbid you from placing an electric supply to your towel warmer within a certain number of feet of a tub, shower, or sink. Once you know the location you’ll be mounting the towel warmer, then – based on the towel warmer you have and where its electrical wiring is – you can determine the location you’ll need to have a single gang electrical box in the wall. Run electrical wire that box from a power source, and cap the box with a cover, with the wire sticking out. Always lean toward having a licensed electrician do this if you aren’t experienced with electricity…A towel warmer isn’t worth electrocuting yourself or burning your house down! Depending on the instructions provided by the manufacturer of the towel warmer you choose, you’ll either need to find two studs in the wall to mount the unit to, or use heavy duty drywall anchors to connect the unit to. Make sure you take the time to get the towel warmer rack as perfectly level as possible, as any deviation from plumb/level will show up like a sore thumb! Q: Are towel warmer racks only for the bathroom? A: No! Towel warmers are increasingly being used in kitchens, basements, mudrooms, and even bedrooms. Q: How long do towel warmers take to heat up? A: It depends on the make and model, but they generally take anywhere from 10 minutes up to 1 hour to heat up. Because of the time it takes to heat up the unit, and heat the towels hanging on it, with how efficient electric towel warmers are today, it’s recommended to leave them on all the time. They usually have a built-in thermostat and thermal cutoff feature that heats the unit to a set temperature, turns off the heating element, and then back on for brief periods of time to maintain the temperature; so the units are not on all the time. Q: Are towel warmers safe with children in the house? A: Yes, towel warmers are made to be safe for the average household with children, including the thermal cutoff features in many that keep them from getting too hot. In general, they’re designed to heat to a range of 100 to 150 degrees, which will provide the most heat possible to the towels without being so hot it burns a person’s skin when touching.